This past weekend Brad Paisley’s 2017 Weekend Warrior World Tour kicked off by playing to over 40,000 fans in Saratoga Springs, NY, Camden, NJ and Raleigh, NC. 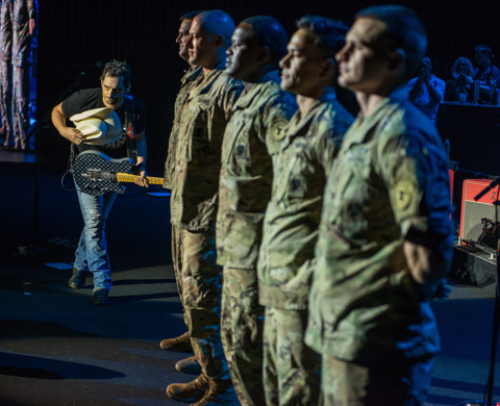 Armed Forces Day was on Saturday and one of Brad’s favorite portions of the show was when he invited local military onstage with him while he performed “Love and War,” the title track from his new album. “Thankful for the ones who have served and continue to serve our country” – Paisley posted to his socials after the show. Paisley is providing an opportunity for fans to join him in showing appreciation and love for our military. Now through Memorial Day, anyone who orders his new album, LOVE AND WAR, (HERE) an additional copy will be sent to an active member or veteran of the U.S. Armed Forces. The 2017 Weekend Warrior World Tour will continue on June 16 – all dates can be viewed at bradpaisley.com. Special guests on the tour include chart-topping country star Dustin Lynch, hit-maker Chase Bryant and rising star Lindsay Ell.